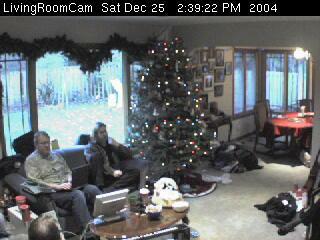 A camera in our living room and kitchen, a capture board, a DSL connection, a little software and what do you get? A family's home on the Web! Welcome to our living room. We are usually around in the evening (Pacific Standard Time). Send us email and enjoy relaxing at our house. A pictorial description of how the hardware is put together is on the How It Is Done page. 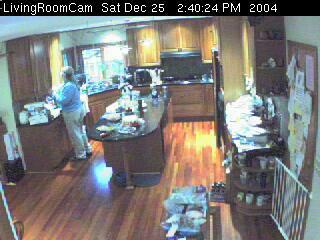 Songbird's Webcam -- a nice lady who has had a cam possibly longer than I have. The Wired Home -- not exactly a cam (although he has several). This fellow also records when the toilet was flushed, when the cat uses the litter box, what was thrown away in the trash bin and many, many more measurements of a home in the Netherlands. Drive Me Insane! 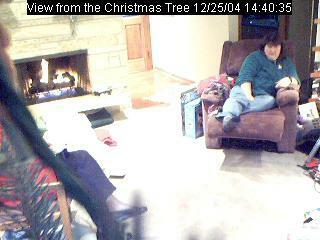 -- another person with cams and a remote controlled house. The "drive me insane" part is that YOU control the lights in his house. Webcams in Freudenstadt, Switzerland -- good city cams from far away, exotic Switzerland.